Prepay your stay for a minimum of 3 nights and save 15% on our best available rate! Rate Not Refundable. Prepay your stay and save 10% on our best available rate! Book with us and you can have the best rate available on the web! Special Promotions to stay at Ultimo Mulino! Find out how to book the room with a special discount! During your stay at L'Ultimo Mulino you have the opportunity to access the services of the Wellness Centre of Palazzo Leopoldo in Radda in Chianti. Our hotel in the heart of Chianti in Tuscany is always happy to host and contribute to the success of ceremonies, weddings, occasions and anniversaries. We are ready to offer you a fascinating place, the delicious dishes of the ancient traditional Tuscan cuisine, wines that are authentic and nectars for the palate, an elegant and dedicated environment, and beautiful scenery that will make an ideal backdrop to a memorable day which will star along with all your loved ones, for moments full of joy and happiness to remember. For the fulfillment of those serene intense moments, our hotel for ceremonies and weddings in the Chianti region in Tuscany is the place you're looking for! With a stay at our hotel at the Tuscany hills of Siena, touring the Chianti you will see why many tourists from all over the world come around here on vacation and come to be fascinated by the flavors, colors, aromas and fragrances of this land. You have most probably read, seen or have been told about Tuscany countryside of Siena, but no text, image or video can make the idea of the atmosphere which characterizes this part of Italy which seems suspended between charm, magic, history and mystery, between reality and fantasy. Living it is the only way to know, and with a stay at the Ultimo Mulino, hotel located in the Tuscan countryside of Siena, you will be a wonderful part of it. Choosing hotel offers in Chianti of the Ultimo Mulino, charming hotels in Gaiole in Chianti, is a good choice for your holiday in Tuscany. At a great value you can have an impeccable service, elegance, style, a living room equipped with all the necessary comforts and you are in a unique and impressive environment. The hotel offers of Ultimo Mulino is proposing to consider any need and any aspect of your vacation, to give you the opportunity to stay in the Chianti region in Tuscany affordable, without compromising the quality offered by a 4 star hotel. Accommodation in Chianti, hotel L'Ultimo Mulino offers comfort, elegance and charm, to spend a relaxing and rewarding period of rest in the green heart of Tuscany. 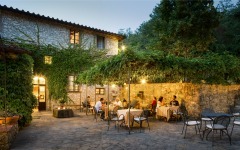 Anyone looking for a safe address to stay in Chianti find it at the Ultimo Mulino. Courtesy, availability and all the attention required for well-being, spent in contact with a rare beauty. Choosing to stay in Chianti means offering your body a wonderful bed in one of the most beautiful places in Tuscany and Italy. From our hotel you can visit the famous Chianti castles, ancient buildings that are worth being known and appreciated for their beauty and their place in the landscapes that surround you for being spectacular. Starting from our hotel to the castles of the Chianti will follow pathways that involve your every sense and will make you fly with the fantasy in the days when these buildings were inhabited and teeming with life and passions. Entering a castle, abbey or a fortified house will seem to get into a real time machine! L'Ultimo Mulino is a small hotel situated in the green of the Chianti, the result of a careful restoration of an old mill of 1400. Everything has been conceived and designed with the sole intent of keeping the original atmosphere of this wonderful country cottage: stone walls, ceilings with exposed beams and terracotta floors! Do not miss the opportunity to stay at this little gem of hotel in the center of one of the most beautiful areas of Tuscany, Chianti. All the rooms of Ultimo Mulino have been designed with the right attention to detail in respect of the atmosphere of years gone by. The hotel rooms range from standard to superior to the finest suite and are all equipped with the usual comforts of a 4 star hotel: heating, minibar, air conditioning, telephone, satellite TV, hairdryer and safe. In our restaurant, in the countryside of Chianti Classico, we offer recipes of the Tuscan tradition, dishes found in recipes of our grandmothers, with particular attention to seasonality and freshness of the products used. We have also put a lot of attention in the choice of wines, both local and national and foreign, to be perfectly matched to the delicious dishes that every guest will have the pleasure of tasting. L'Ultimo Mulino is immersed in the green countryside of Chianti, near a small stream that makes the days always fresh and never too hot. The park overlooks all the hotel rooms, the beautiful and elegant dining room and veranda where breakfast is served in the morning during summer months. The hotel also features a beautiful outdoor swimming pool where you can spend pleasant days in the company of a good aperitif or a good snack. Guests of the Ultimo Mulino also have the option of enjoying the wellness center and indoor swimming pool present at Palazzo Leopoldo, another beautiful 4-star hotel of Ross Hotels Group chain. The hotel is located in Radda in Chianti, just 5km away, and our staff will be at your disposal to provide all necessary information to reach the structure. L'Ultimo Mulino is located in the heart of one of the most beautiful areas of Italy, Chianti Classico. From here you can visit small villages, remained intact despite the passage of time and fascinating medieval castles still immersed in the splendor of centuries ago. The hotel is also the perfect place from where to start the discovery of the most beautiful cities in Tuscany like Siena, San Gimignano, Cortona and Florence. The village of Gaiole in Chianti has been referred to as "Europe's most idyllic place to live" by the experts FORBES! Read this interesting review that confirms the goodness of choosing the Ultimo Mulino and Gaiole for your stay in Chianti.